The company will test out technology that will help prevent traffic congestion, correct driving errors and avoid collisions. FORD IS FOLLOWING in the footsteps of Google, Volkswagen and other automakers by revealing its new self-driving car. 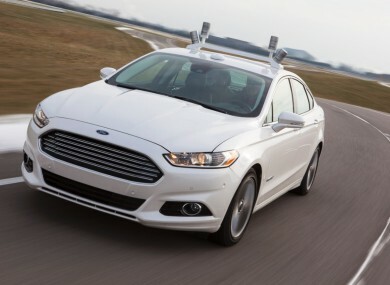 The hybrid Ford Fusion, which was developed in collaboration with the University Of Michigan and insurance company State Farm, will be used to test the reliability and efficiency of existing and future sensing systems and driver-assist technologies. The car has four scanners called LIDAR (Light Detection and Ranging) attached to its roof. When linked together, it creates a 360-degree, 3D view of its surroundings. This allows the car to decide whether it should accelerate, brake and steer without a driver and help it correct driving errors. The company is also working on developing communication between vehicles that will alert drivers to traffic congestion, accidents and weather conditions. Further down the line, Ford expects features like adaptive cruise control, and vehicle-to-vehicle systems, which will allow packs of cars to join traffic on motorways, will be introduced. Ford also highlighted the need for different sectors such as insurance companies, car manufacturers, researchers and legislators to collaborate when driverless cars are released to the public. Email “Ford reveals its first self-driving research car”. Feedback on “Ford reveals its first self-driving research car”.